Use in the guest bedroom, and people have said, best sleep ever. Sleep soundly with this set of Tommy Bahama Ultimate Down Alternative Pillows. Featuring a soft, down-alternative polyester fill with 230 thread count cotton cover, each pillow offers support while cradling your head in comfort. Not quite what I had hoped. I will say these pillows have a very nice weight to them and are high quality construction. Hence the three stars. But otherwise, I do not care for them. I am a side & stomach sleeper and found these just didn't work for my needs. I will explain... This pillow's loft is very high and does have nice memory to it. The problem is, the pillow retains its natural shape, high in the center, even when in use. As a side sleeper, I need something "scrunch-able" to bunch up under my neck and lay flatter on the side of my face (to keep normal, straight spinal alignment). These pillows won't do that. They are soft, but about as "scrunch-able" as a memory foam mattress. Unfortunately, it doesn't work sleeping on my stomach either. The filling is too dense to flatten it out much, and it takes a fair amount of pressure to do so. I imagine this is great as a back sleeper so that your head is well-cradled, but when your face is turned downward and to the side, the high loft filling "memory" just causes the pillow to waft up around the face. This creates a suffocating effect and gets very hot! I have to resort to only using the last two inches of the side of the pillow when on my stomach or I cannot breathe. Also, because the loft is so high and springy, I cannot apply enough pressure to lay the center of the pillow down very far. What this means, is your head and neck are always angled upward. NOT very good in either the side or stomach positions. Again, I can see it being ok for a back sleeper where some incline is appreciated, but it caused neck pain and tension for me. It softened up a bit after a few days, but not enough to be comfortable. Sooo, I thought I would leave an honest review of the pillow and state HOW I use the product (something most reviews lack). Yes, it's excellent construction but if it doesn't work for you, then it's not money well spent. I will have to keep looking! Love theses pillows. Good alternative to down. I'm a dedicated down pillow fan, and I deliberated long and hard before ordering these down alternative pillows. I made my decision based on all the customer reviews about their quality and softness--in particular, how another customer who had always used down pillows was so happy with the alternative filling, and another customer who was in fact not happy with the pillows because they were too soft and provided virtually no support. Down pillows are soft and flexible. So when I received the two Tommy Bahama Ultimate pillows that are so think and firm that there's no way I can sleep comfortably on them, I was very disappointed. They're well made, but definitely not how all the information available described them, and certainly not a viable alternative to the real thing! I purchased these for my mom as her Mother's Day present and now I have to buy myself some. But I am having trouble finding king sized. She thanks me all the time for these awesome pillows, very comfortable and so so so soft!! You cannot go wrong with anything with the Tommy Bahama name on it. It truly means quality. My husband and I just purchased a new bed and I wanted new pillows and bedding. I"m normally a stickler for good quality down pillows - but since I had to replace everything (we upsized on the bed), I needed something more affordable. The reviews for this set of pillows were good and the price was right, so I bought a set. They are great! I don't miss my down pillow at all, but like any new pillow they do take a bit of getting used to. They provide excellent support, plump back up all by themselves and I find them to feel quite luxurious. The price is amazing for the quality. very nice pillows, down alternative little firmer than down. Plump, yet soft and conforming to the head. I like these as an alternative to down. I've never been a good sleeper and have tried many different pillows thru the years and most have lost their shape after a few months. I'm a side sleeper who likes a medium to firm pillow, which is difficult to find. Most are either too firm or start out firm and quickly go soft and lose their shape. Thus far, the Tommy Bahama Ultimate Down Alternative Queen-size pillow has been very comfortable and maintained its shape and firmness. I only use 1 pillow at a time, so whenever this pillow becomes either too soft or loses it shape, I'll have a brand new pillow to take its place. Its been about a month and thus far I'm very satisfied with the pillow and would recommend it to people who are constantly searching for the right pillow. While most quean sheet sets come with standard or king pillow cases, there are many bedspread covers that included decorative pillow shams that are queen size, A standard pillow makes them look deflated and a king pillow won't fit. Queen size pillows are both hard to find and usually overpriced. These fit perfectly without breaking the bank. I purchased these pillows just to stuff my matching shams. They are quite full and nice. I find myself laying my head on these in the middle of the night. I prefer these over a $100 memory foam pillow. Bought Thr pillows after reading the reviews, however, I find the pillows way too soft. There's is no support for my head, and I feel like when I put my head on the pillow, it goes right to the mattress. 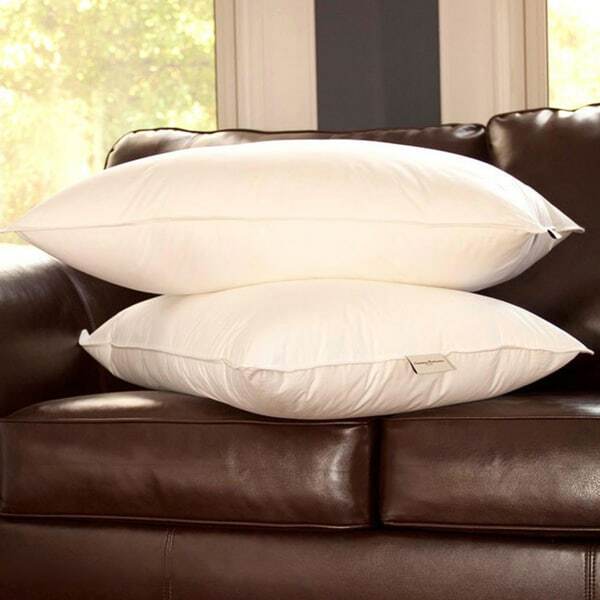 These Pillows are so luxurious, The quality is Great and I slept sp well on Them. I've been having trouble with my hands going to sleep and wakeing me in the middle of the night. Found out that I was sleeping on the wrong pillows. Ordered these and have had no trouble since. They are great for the price. These pillows are comfortable, and hold their shape after about a year of use. Very happy with the purchase at the price, and comparable to much more expensive pillows. The pillows are a little flat and don’t stand up on bed. We were hoping for a little thicker and sturdier. They look good in the shams lying flat but not sitting up. The most comfortable pillows I ever slept on. I slept like a baby! These are fabulous! My adult son cane to visit and took them home with him, he loved them so much! So now I need to buy more, which I will do. Very comfortable. Great purchase. Keep form and soft for a year now. Very nice and well made. They are a bit to firm and full for my taste though. If you want a softer pillow this is not the one for you. Even after months of use the remain very fat and firm. I purchased these for my guest room and my son took them over so that tells you how comfortable they are lol. I love them - they are what I call squishy cloud pillows and I would definitely purchase them again. "I'm a back sleeper with sleep apnea, what is best type pillow"
"Where can I purchase a Tommy Bahama extra firm queen size? I used to buy them at * but they don't carry them anymore." "Would this pillow be considered as firm or medium?" Firm first few months, then medium. "You have different sizes under the options section, but your dimensions for all of the sizes is 20x30". Why is that?" The measurement provided is for the standard size, which measures approximately 20 inches x 30 inches. We apologize for any confusion. "It's unclear as to the size of the Standard pillow, the standard being 20 x 26, but the description gives the same size to all four options: Dimensions: 20 inches wide x 30 inches long with 30 ounces of fill per pillow. I only have standard size pillow cases, can you advise?" Hello nellie, we do apologize for the confusion. The pillow is featured in the following approximate dimensions and fill; Standard - 20 x 26, 26 oz. Filling Each Pillow, Jumbo - 20 x 28, 28 oz. Filling Each Pillow, Queen - 20 x 30 Inches, 30 oz. Filling Each Pillow and King - 20 x 36, 38 oz. Filling Each Pillow. Thank you for shopping with us. Hello nagl, the country of origin is USA. Please let us know if you have additional questions. Thanks for shopping with us. We needed some more pillows. Purchased asset not long ago - love them - need more!